Appearances to the contrary, the handsome young men in the photo are not up for the parts of Curly, Moe and Larry. 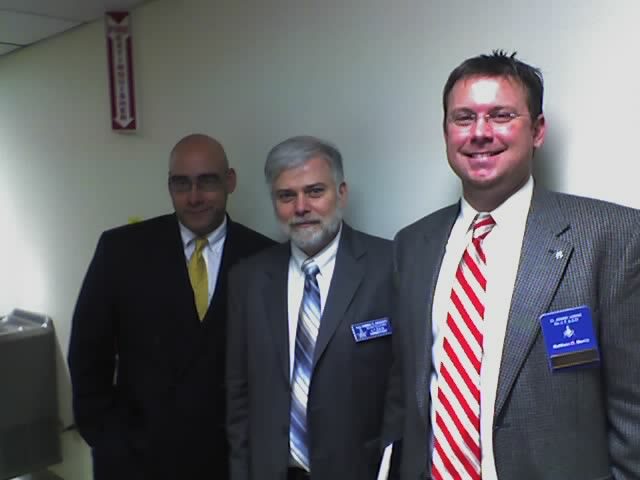 No, that’s me in the center, flanked by two of the four five Connecticut Masons who are guilty of blogging. Movable Jewel currently serves with me on the Committee for Masonic Education, and North Eastern Corner came to the recent officer’s seminar held at Ashlar Village, the Masonicare facility in Wallingford. I’ve discovered that I have more online friends than local friends, so it’s always rare but interesting to run into someone that I “know,” but have never met in person. As it happens, though, I have met all of the Connecticut bloggers. Masonic Renaissance is a fellow District Grand Lecturer, and the mono-nymed Radcliffe of Metaphysical Freemason – the latest person to admit “If Tom can have a blog, then anyone can” – is actually a member of my lodge. Is Connecticut big enough for five people to blog about Masonry? Hartford Advocate writer Adam Bulger wondered about the proliferation of Masons who blog in his recent article. What didn’t make the article was that a lot of Masons are proud of their membership, and enjoy talking about it. Unlike the old days when you might never know that a relative had been a member of the Craft until after he died and you were sorting through his things, many Masons today are interested in exploring their journeys, and in discussing how similar and yet different their experiences are. Of course, some of us (*ahem*) are just attention hounds. The seminar itself is a half-day session in which Junior and Senior Wardens are given an overview of the things that they’ll need to know for when they assume the Oriental Chair. The seminars are a little different every year, but we cover a little bit about planning and organizing, team building, Masonic jurisprudence, rules and regulations, how to run meetings, etc. We also have a similar seminar for those who expect to be elected as Master in the coming year. We stress planning and team-building because most of us can’t think of anything worse than having the new Master take the gavel and then say “Uh, okay. Now what?” Similarly, if a Master has a plan for his year, he needs to understand how to delegate tasks, and how to follow up on them so he’s not caught short at the last minute. I was very pleased to find that all of the attendees that I talked to found the seminar enlightening and informative. A nice post about the Warden’s Seminar can be found on Movable Jewel’s blog.